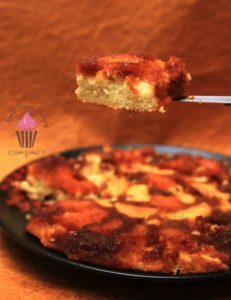 I’m writing a post on Fondbites Bake Along recipe after a long time, though I have made quite a few recipes after my last bake along post, I never blogged them, just shared the pics on my page and in the group. 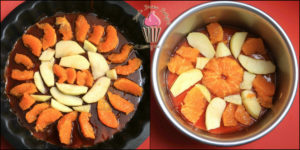 Anyways, in the original recipe, Subhashini has used Oranges. I have used Clementines (a variety of orange) and Apples. You can use any fruit you like, go ahead and experiment! I baked the recipe in 2 pans- an 8″ pie pan and a 6″ cake pan with a removable bottom. *You SHOULD grease your pans and line them with baking paper and grease that also generously. 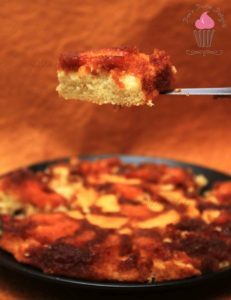 *If you are using a pan with a removable bottom, place it on a baking sheet because the caramel tends to seep out of the gap. Though it is not really a problem to use these pans, I suggest not to just so that you don’t waste some of that gorgeous caramel. 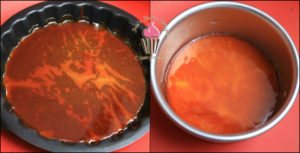 *While making the caramel, once the butter is added, immediately pour it in the prepared pan(s) and swirl it to coat the entire base because the caramel starts setting very fast. First get your pans ready by greasing the bottoms, lining them and greasing the butter paper. In a heavy bottom saucepan, take the sugar, water, salt and bring it to a rolling boil. Bring down the flame to low and keep swirling the pan from time to time, do not stir it. Watch it closely for change in color. Do not leave it unattended at any time. Add the butter and whisk it in briskly and immediately pour it and swirl it around in the pan to coat the entire bottom. Be quick but careful. 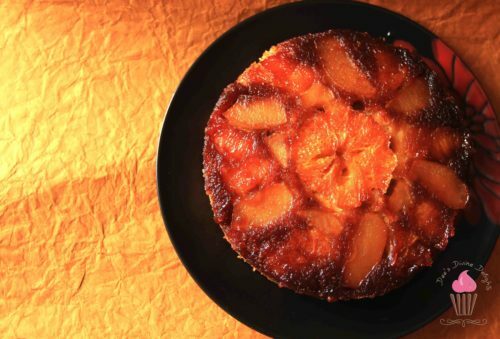 Arrange the fruit wedges to your mind’s liking, on top of the caramel in the pan. Whisk together the flour, baking powder & soda, salt and almond flour/meal in a bowl and set aside. Add the butter and castor sugar in the bowl of your electric mixer and beat in medium-hi speed for about 5 mins until the mixture is pale, creamy and fluffy. Add the eggs one at a time, beating for 1 min after each addition. Scrape the sides and bottom of the bowl as and when necessary. Add the orange zest and vanilla extract and beat until well combined. Add the dry ingredients in 3 parts, alternating in between with the milk in 2 parts. Always start and end with the dry ingredients. So it goes, Flour-Milk-Flour-Milk-Flour. Beat on low speed after each addition, only until its well incorporated. Do not overbeat. Scoop the batter evenly on top of the fruit wedges in the pan and gently smooth it out using a spatula. Be careful not to move or disturb your fruit arrangement at the bottom while doing so. 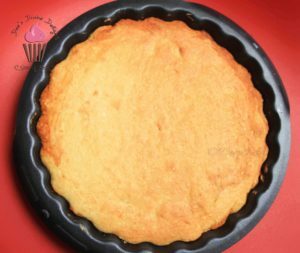 Bake in a 180*C preheated oven for 25 minutes (the time may vary according to your pan size, so check accordingly) or until a tooth pick inserted in the centre of the cake comes out clean. Cool on a wire rack for 10-15 mins and while its still warm, carefully invert the cake onto your cake board or serving plate. Ta-da!! 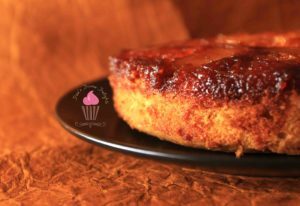 The yummiest upside down cake is ready!!! Look how glorious the caramel looks.. The cake by itself tastes so yumm and the texture is so nutty because of the almond meal. You cannot stop with one slice, I guarantee that! 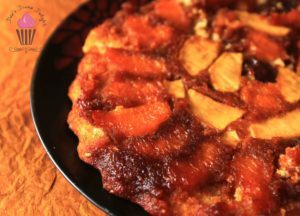 Try this recipe with other fruits like sweet lime, pear, peach, etc. You will not be disappointed.. So while I try to tackle a few of the books I have lined up to read, you try this Tequila Sunrise and let me know how it works out for you..